The high performers are focused on sustainable success of the organization in terms of both top and bottom line performance. They work hard to achieve the goal of an organisation. They tend to be focused more on the effective use of the resources available to the organization for better results. High performers do not like living in the world of uncertainty. They are therefore prompt and firm in decision making. 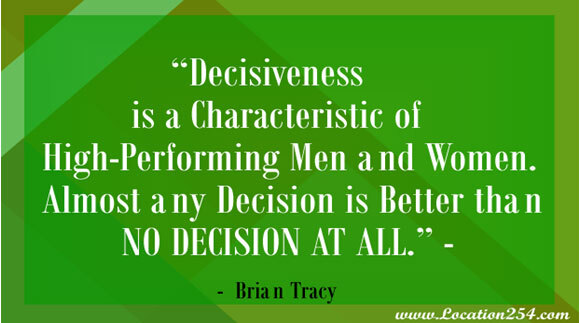 Does it mean that they are perfect in decision making? No, they make a lot of mistakes in the process but they also learn a lot from their mistakes. The most important is they accept their mistakes, make corrective action and they immediately move forward with a lot of confidence. High performers are very clear with their mission and the approach to achieve their mission. They freely talk about the mission and its impact on them in particular and the community in general. Whatever they do is aimed at advancing their mission. The high performers have a positive mindset which makes them have a positive approach to various life situations. They see business opportunities in every life challenge. It is impossible for a high performer have a negative mindset because nothing positive can come out of negative mindset. High performers have a business approach to life. They appreciate a business has to grow in value through making sustainable profits. They analyzed every situation in terms of its impact on the top and bottom lines. They tend to focus on building value adding relationships with staff and current and potential customers. They tend to put a lot of emphasis on planning which involves developing the roadmap which can be used to achieve the goal of the organisation. The process involves determining the goal of the organisation, ascertaining the current state and developing a strategy to move the organisation forward. High performers tend to be value driven. According to research high performing organizations are those who have strong values. An organization performance will be different from its counterparts depending on the strength of its values.